Let’s face it, the obsession with cupcakes has really raised the bar for anyone considering making cupcakes for a party or event. Of course there are folks like me who think the over-frosted/over-sprinkled/over-developed cupcakes are seriously lacking. I remember cupcakes from childhood to present as something ‘home-made.’ This whole bakery/cupcake maker version really peeves me, especially since it seems the cake/frosting is just not that good. Plus don’t even get me started about the $4-$8 a cupcake price factor. Now I know there are some real gems out there in the cupcake industry, but unless I am craving that specific flavor or brand I am not going to try to recreate it home. That being said, I did feel a little self conscious bringing a dozen or so ‘box-cupcakes’ to a party simply because they weren’t those cupcakes on steroids that seem to be the ‘in’ thing. Well after playing around with the box recipe and lots of frosting brands I’ve found the best cheat. Believe me NO ONE believes they are ‘box’ and it will almost hurt to admit they are because people start begging for the recipe. Plus they are less than $8 for between 16-20 of them. Step One: Follow all the directions on the box as per ingredients – I’m sorry, but if you’re trying to add egg whites only or low-fat/cal oil – just stop – it won’t taste good no matter what. Add the full calorie/full content ingredients and just enjoy the damn thing. Step Two: Get out your mixer/hand mixer and actually blend it like the box says. For years I was just mixing with a spatula, but that is the worst mistake, you need to use the electric mixer to get the batter light and fluffy (almost mousse looking) and you need to mix for at minimum 2-3 minutes. This may seem like a no brainer, but this is why cupcakes turn out flat and dry instead of moist and with volume. Again, if the batter is runny keep mixing! Look at that volume/rise below! Perfect!! 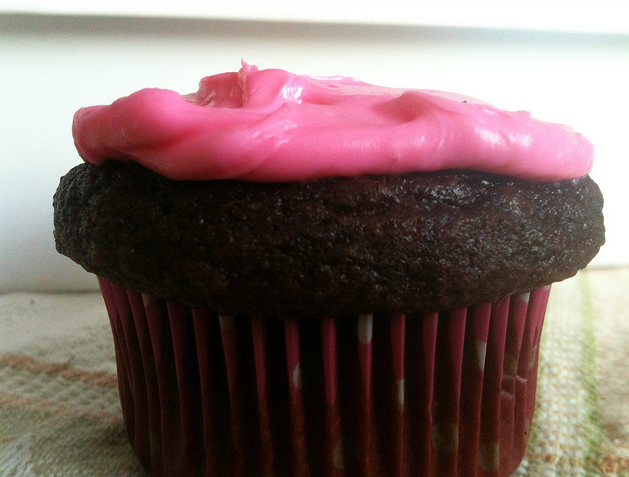 MOST IMPORTANT – Step Three: I fill the cupcake liners with a 1/4 C measurer and fill them approximately 3/4 of the way. You probably won’t get all the way to 24 since that amount of batter is more than the box suggests. Cook according to temperature BUT only cook the cakes for 15 MIN!!!! Of course since ovens do vary please check with a toothpick/cake tester to ensure it comes out clean. This will not only make the cakes moist from the start, but they will stay moist for days (if they last past the event). So the cakes are done – I usually take them out of the muffin pan as soon as I won’t burn myself and wait for them to cool fully for the frosting. I really enjoy Pillsbury Brand Frosting “Creamy Supreme.” Obviously not the healthiest, but come on if you’re going to argue about natural frosting at this point either make your own or sit down. I generally use Vanilla so I can customize colors and flavors (Nutella/cinnamon flavor etc). 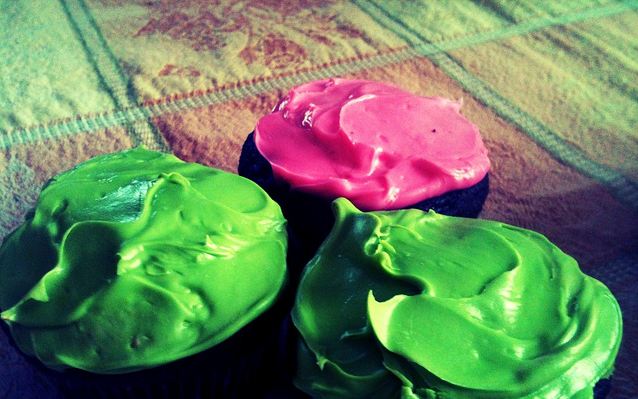 I’ve used professional food dyes before and those can make the frosting actually taste terrible. 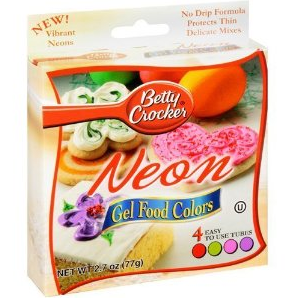 I happened upon Betty Crocker Food Gels and they are the best and brightest in my opinion. They carry standard primary colors and then neon which are a blast. 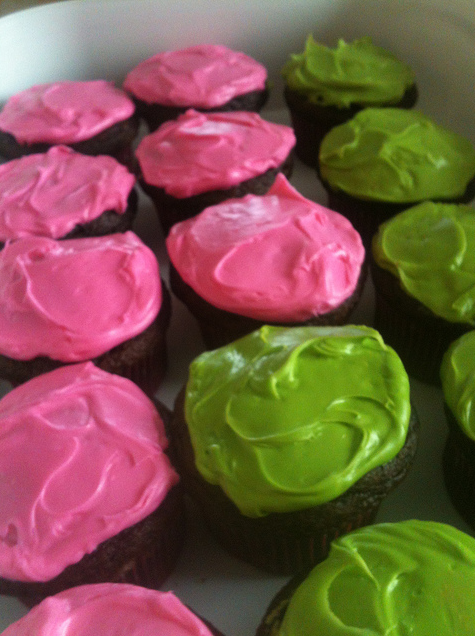 Using a gel food coloring will also add that shine that is on my cupcakes. Of course these are not the gourmet cupcakes, but I am not a gourmet pastry chef. These are a great version of an old stand-by and whether this is the limit to your baking skills or just a substitute for last minute treats, I hope you’ll have fun and remember what baking cupcakes at home was always about – LOVE! Next > Relax and Practice?